My former aesthetician, Brooke Moinet, has a nice little blog focusing on all things cosmetic, including makeup, hair, and plastic surgery. Take a peek at her site here. Brows: Natural, full brows that are groomed and have shape are in-style, and most flattering. So, if you’re still sporting the two rows of hair above your eyes, you need to cancel your next brow appointment and make it for about six months to a year. Unless you’re a drag queen, you need to start growing those babies out. Best wishes on your move to Miami, Brooke! 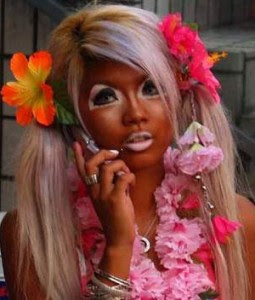 LOL that's a ganguro. I've always thought they were kinda cute in a creepy, Hot Topic doll way. that's all fine and good, but I have a unibrow if I don't get my brows waxed at least every month. your advice doesn't really apply to hairy people. Nicole Kidman or Wax Figure? Rhytec (Portrait) Goes Out of Business? Lisa Rinna Admits to Having "Too Much Filler"